I’m working my way through the eats at Galleria 7 Market in Latham/Niskayuna. The first thing I tried was Anna’s Wood Fired Pizza. Very good. Across the Galleria from Anna’s is Chops and Hops. 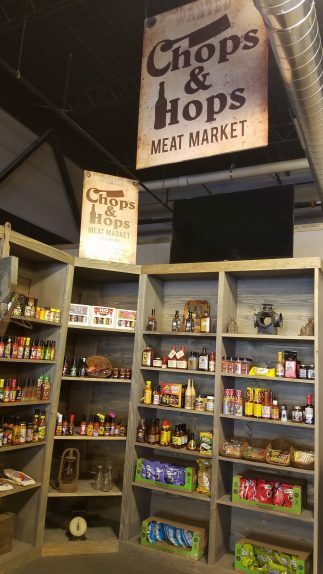 They have a meat case with about 10-12 different cuts of meat and other various little hot sauces and trinkets toward the back. 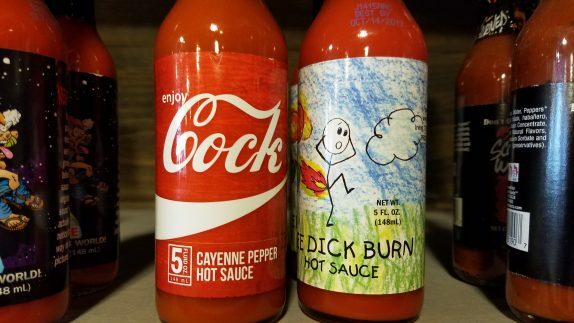 Hot sauces say the darndest things. They also have a pretty prep area in the back. It looks like they have a cold station, a flat top, and a 4 top burner with oven. 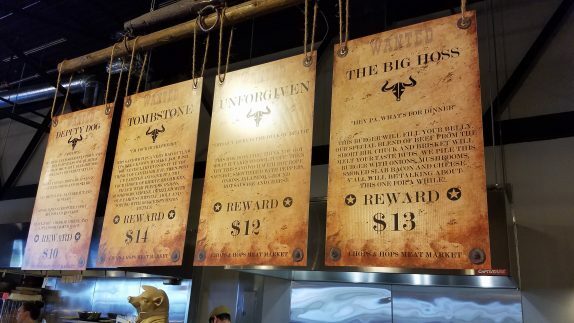 It took me a couple of trips to realize the signs above the meat case are actually things they can make for you. There are hot dogs, burgers, and cheesesteaks. It’s really a lot to read and, like I said, not immediately obvious that the signs are for things you can order unless you read them front to back. 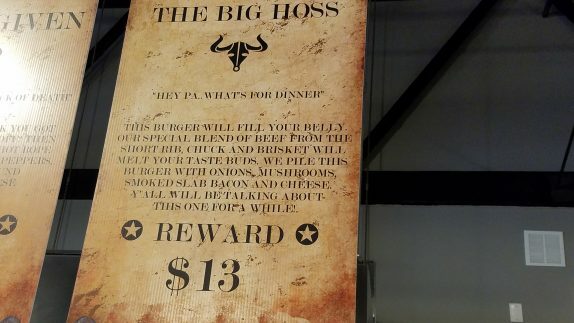 On my visit for dinner, I tried The Big Hoss [burger (blend of short rib, chuck, and brisket) piled with onions, mushrooms, slab bacon, and cheese – $13]. My honest expectation was a double patty on a bun with the other stuff when I saw him put 4 patties up for seasoning and onto the flat top. Then I saw him whip out two long planks of Italian bread and add a copious amount of butter to them and realized this was going to be a big deal burger experience. I spent about $15 with the addition of a Saratoga water. 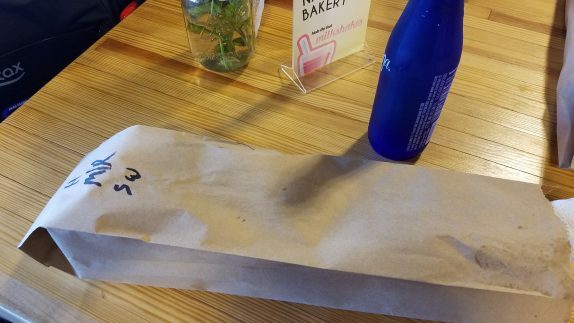 The burger came wrapped and packaged up just like a sub. Inside of the packaging were a small cup of cole slaw and an atomic fireball, a fun touch playing into the hot sauce motif. 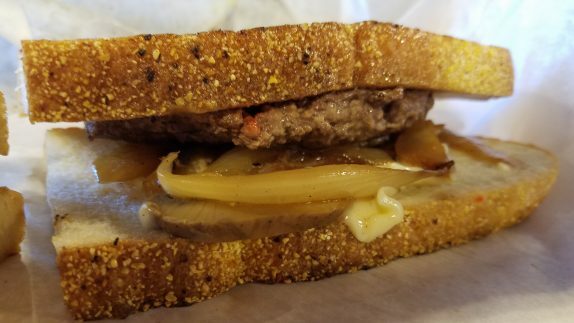 The Big Hoss is basically a double patty melt. I didn’t mind one bit since I’m always up for a big burger. It would be nice if the menu made it clear what it was, especially since there are comparable burgers for comparable prices in restaurants within feet of Galleria 7, but I’m calling that a minor detail. The bread they use is a very dense Italian bread, almost as dense as semolina bread (it may even be semolina). Aside from the voids near the extremities of the bread, the bread to meat ratio is perfect. The beef is a relatively fatty mix and that results in a very flavorful burger. It’s seasoned with a very orange seasoning salt that helps it develop a crust on the flat top. The toppings were lacking. The sauteed onion on top was very good; I just wish there was more. 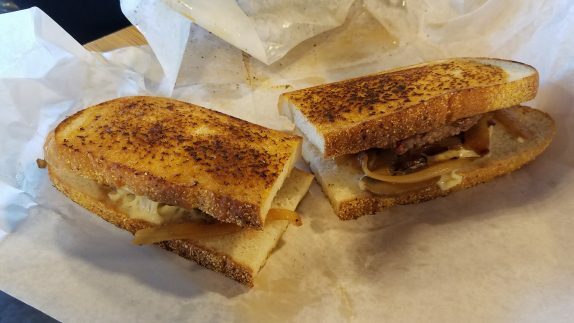 I couldn’t figure out what was going on with the 2 slices of mushrooms that were across the entire sandwich; they were stewed and marinated. It’s not unreasonable to think they were canned or jarred. For me, there’s nothing wrong with that if it tastes good, but there really wasn’t enough to tell. I had forgotten there was bacon on it until I got to the major axes of the somewhat elliptical segments. There was one thick slice spread across the the whole sandwich. It was very good, but there wasn’t enough to stand up against the burger and bread. The cheese was American, which is as perfect as a cheese as you can use on this type of sandwich. It was an incredible deal for the price. I was definitely full by the time I finished. I didn’t even get to the Atomic fireball. 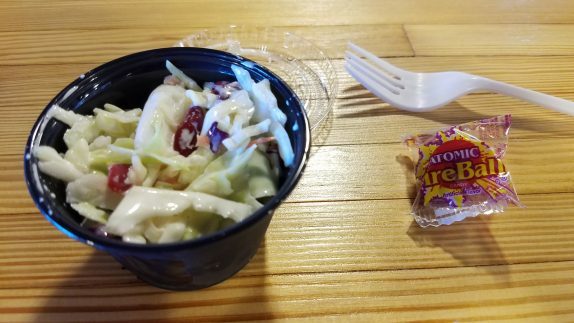 I did have the cole slaw which was fresh but standard aside from a few dried cranberries.